I hated Dubai after my first trip to the city in 2009. It was unbearably hot that September. We couldn’t go out . We had to run from my aunt’s house, where we were put up, to Dubai’s many malls seeking refuge in the air-condtioning. On that trip were on our way back from Switzerland. After the natural beauty and quaint charm of Switzerland, Dubai seemed too synthetic to me. It seemed like we were in the sets of the TV show Jetsons. An artificial, futuristic, soul-less bubble. I left Dubai very unimpressed and with no desire to return. Since then my aunt, who lives in Dubai tried to tell me about its charms and assured me that the city is very different and pretty in winter. Over time I also got to meet people like Dubai based food blogger Ishita (she blogs at Ishita Unblogged) on twitter who would tell me about interesting things happening in Dubai. Then our friends Jean and Brian moved to Dubai from Mumbai and said that they were loving it there. Four years after my first trip there it was finally time to return to Dubai. I decided to stop at Dubai on my way back from the Madrid Fusion festival at Madrid. The idea was to spend my birthday at Dubai. This is something K and I had been planning for a while. My aunt and Ishita assured me that the weather would be pleasant in early February. Things worked out beautifully as an office trip to Dubai came up for K around the same days and she could join me. It was as if Dubai was calling us back. So there I was at Dubai, a couple of nights before my birthday, on my way back from Madrid. I encountered my only false note of the trip after landing when the taxi traffic control guys directed me to the more expensive cabs (the gleaming black sedans) when I came out of the airport. This little airport scam fallen for it was time to begin my second Dubai innings. I had returned to Dubai with an open mind despite my earlier reservations. I was on a mission to seek out its soul which so eluded me last time. When it came to its food, I had a strategy this time. I would not eat in its malls. I would not eat in the Dubai outposts of Western chains. Instead I would go out seeking the small, local places of Dubai where you could get food from the region and where regular folks went to eat. And that’s exactly what I did over our four days in Dubai. The weather was nice this time (early Feb). One could actually walk in the open during the day and sitting outdoors in the evenings was very pleasant. This was a different Dubai from what I experienced in my earlier trip (in September). This time we largely ignored its gleaming malls and precocious towers and headed to the older parts of Dubai. We spent time at the ‘old new town of Bur Dubai’ which is where we stayed with my aunt and her family. From what I understand this is where the development of Dubai had begun in the 70s. We went to the much recommended Al Ostadi restaurant here. An Iranian restaurant which was established in the 1978 making it one of the oldest restaurants in Dubai. The menu is simple. Lentil based soups and an array of chicken and mutton kebabs (no beef I think). The kebabs are served with salads and rotis. If you want, you can get rice with a dollop of butter (chello). It’s a fairly basic restaurant in terms of seating. In the tradition of the older restaurants of Dubai the main section is for men. There is a small separate annexe which is meant for ‘families’. We went there as that’s where women can sit. We ordered the mix platter so that we could sample all the kebabs. I quite liked the dry lime and the yogurt marinated kebabs which were fairly juicy and well flavoured. I asked K if she, as a Parsi, could feel a connect at this Iranian restaurant. Turned out that she didn’t. The kebabs were from Islamic Iran. They belonged to an Iran from a time after the Parsis had left for India who, I guess, since then have turned more Indian than Persian. I later found out that Al Ostadi is a bit like Mumbai’s Bade Miya. It is highly talked about and recommended to tourists as a place for local, grunge food. However, locals in the know don’t always have high an opinion of Al Ostadi it seemed. Just as I probably wouldn’t send someone to Bade Miya in Mumbai. 'There is better' we will say. Still, for the sense of history (toned down a few notches in the sterile family room), if not the kebabs, Al Ostadi (spelt as Ustadi on the shop front) is definitely worth a visit. Many say that Dubai has been built on the backs of workers from India and Pakistan. This gets reflected in the many Indian and Pakistani restaurants here. I wanted to try out some Pakistani food here as the chances of doing that in India were non existent. Our interaction with the smiling Pakistani cabbie who told us ‘we are friends, it’s the politicians who create problems between our countries’ was the precursor to the lovely times we had during our Pakistani explorations. On my birthday, my uncle took us to Bar.B.Q Tonight, a buzzing Pakistani place where the buffet showcased almost every legendary Pakistani dish from chapli kebabs to Behari kebabs to biryani and Kabuli rice and roghni naan and lots in between. K and I went one afternoon to the branch of Ravi which is opposite the Burjuman Mall. 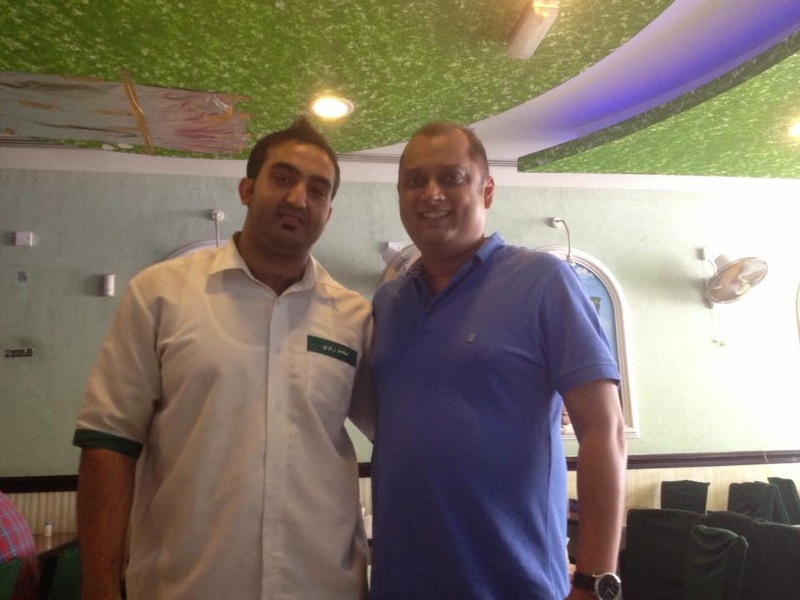 Ravi is a much recommended Pakistani restaurant chain in Dubai. The common refrain about Ravi from people who told me about it was ‘the food is oily but tastes great’. Ravi, opposite Burjuman, too has a family and a regular section like Al Ostadi. The aircon was not very powerful and we were very feeling rather hot during lunch. We had delicious nihari and haleem here. Both were listed under breakfast but were available during lunch too. The meats in both were very tender and we later found out that the dishes were beef dishes. The menu doesn’t specify beef. Not an issue for us but if you have religious restrictions then its best to check in advance about what goes into the dishes here. Our young smiling waiter from Pakistan (whose mother had apparently told him to avoid beef as he was becoming ‘fatty’) recommended a chicken Peshawari to us. This turned out to be an outstanding pick. The curd, green, chilly, pepper and tomato based sauce was slightly tangy, packed with flavours and very alluring and the chicken was quite juicy too. Both K and I loved this dish and agreed that we preferred it to various North Indian curries that we have had in the past, cousins of the Pakistani fare. 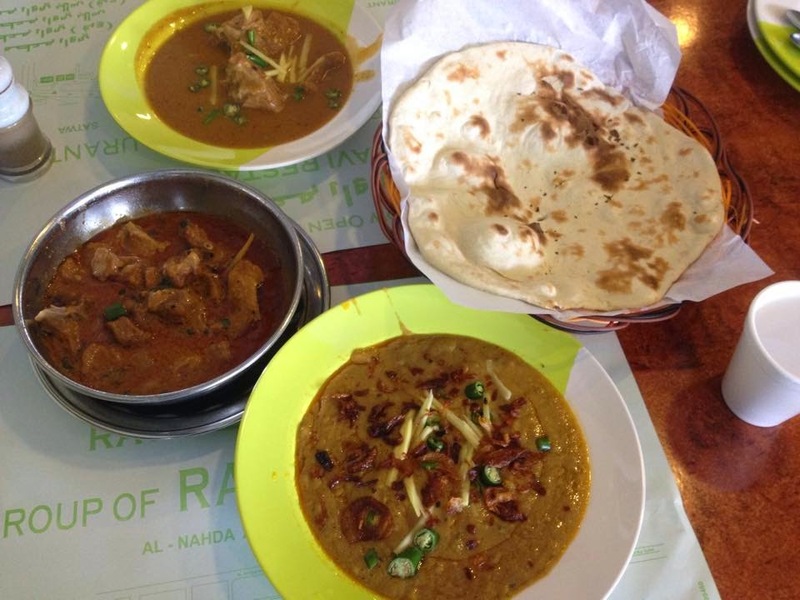 The nihari reminded me of old Delhi and the Haleem of Hyderabadi restaurants of India. The food was a bit rich though for me and I had to follow it with a toilet break at home. 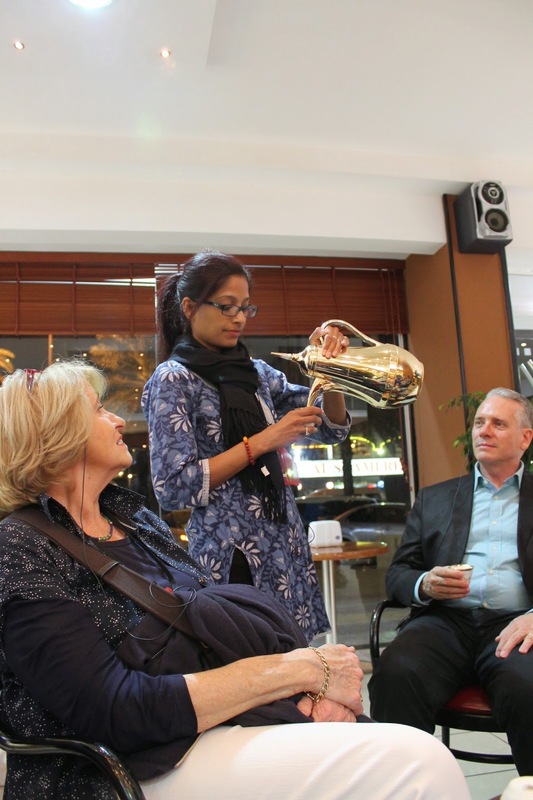 I headed out to a Dubai food walk in the evening. 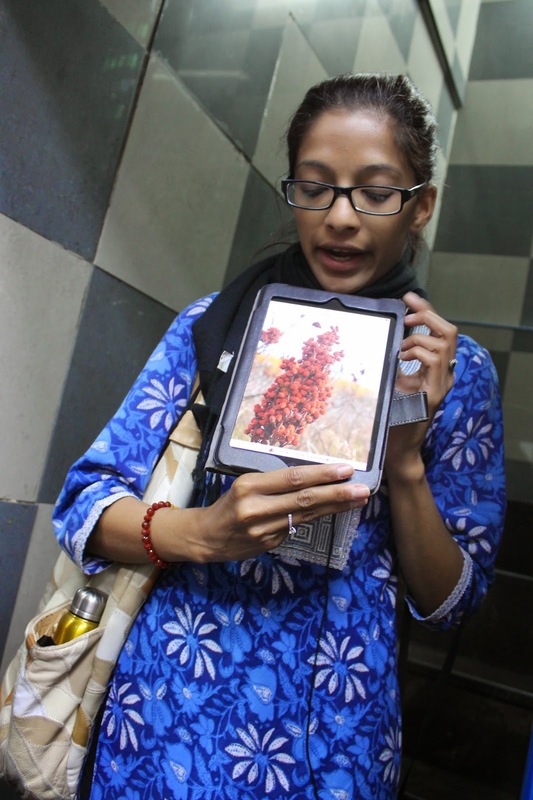 The walk was conducted by Arva Ahmed of Frying Pan Adventures (twitter handle). Arva and I had connected through Ishita on twitter and Arva very kindly offered to take me on a walk as a birthday gift. I joined Arva on her Old Dubai walk. Arva and her sister conduct the walks for their company, Frying Pan Adventures. Arva’s family is from Hyderabad in India. Arva has grown up in old Dubai and loves the city from the bottom of her heart. She had gone to the US to study and then came back to Dubai where she and her sister set up Frying Pan Adventures. Her aim was to help people like me discover the soul of Dubai that was often hidden behind its glistening malls and buildings. Arva on the walk was articulate, witty, energetic and informative and made our group, which consisted of people from all over the world, fall in love with Dubai. In the walk we went to a Palestinian Jordanian place called Qwaider Al Nabulsi, (Murraqqabat Street) where we had Palestinian styled falafels (much better than what I’ve had in India) while Arva told us about how different Arabic countries staked their claims on falafel and hummus. 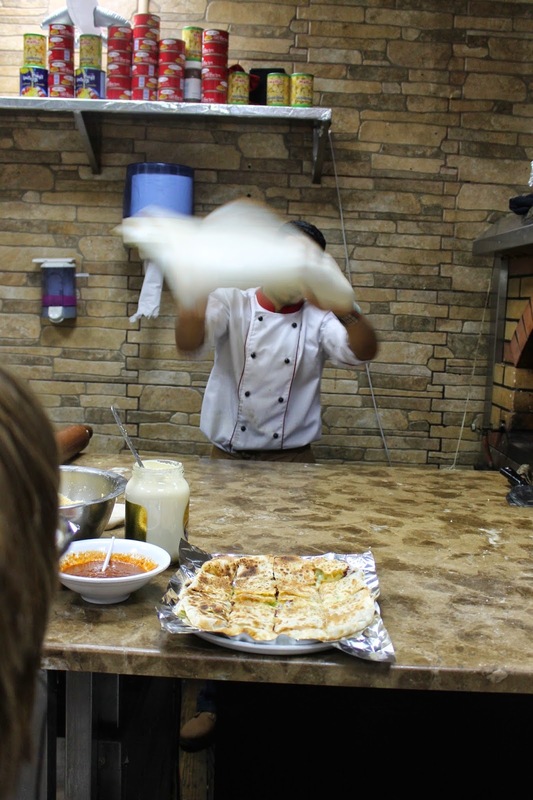 We then had a cheese and ghee and sugar syrup based fried dessert called Knafeh which was made in front of us. I was in for a little surprise once the knafeh was made as Arva took out a candle, put it on the knafeh and made me blow out the candle and cut the kanafeh while people sang happy birthday to me. I felt truly blessed to have such an international birthday celebration. The sugary cheesy crunch of the Knafeh was addictive. We then went to an Egyptian restaurant called Soarik at Al Riggah Road where we had feteer. This is like an Egyptian pizza except that that toppings of mozzarella and pastrami are put stuffed inside the pizza and not put on it. This tasted delicious. Next on was an Emirati restaurant called Al Tawasol, near the Clock Tower, where the recipes are given by an Emirati mama. She doesn’t come herself to the restaurant though it seems as men work there and runs the place from home through her sons. Here you sit on the floor on carpets and eat. There is a large hall where men sit and eat and partitioned family sections for groups like ours with women. We had Shorbat Adas (orange-split lentil soup), Emirati Chicken Machboos (chicken cooked in an Emirati blend of roasted spices or besar and with the rice simmered along with the chicken similar to a Parsi mutton pulao), Laham Salona (very tender lamb curry with the traditional blend of Emirati spices) served over rice; Harees (traditional meat and wheat porridge laced with clarified butter or ghee), and Laban (drinking yoghurt). The machboos and the salona were placed on a large thaal (plate) similar to the Bohri thal in India. Arva then portioned out the food and served it to us on our plates. I was engrossed by her talk about the simplicity of Bedouin dishes and of how the introduction of spices and even rice to Emirati food was thanks to the influence of Indian traders in the middle ages. It was also thanks to Arva that I got to know that Emiratis love fish but that one shouldn't order fish now as the local fish, hamor, is a victim of over farming. Arva really knows how to spell a yarn as we saw in our last stop, a sweet shop calle Samadi Sweets (Murraggabat Street) Arva told us about the history of coffee in the Arab world and the social mores associated with it’s drinking while she poured us coffee (called gahwa and flavoured with cardamom) to have with Karabij (pistachio cookies with the soapwart cream) in the shop, and Ma’amoul (spiced date cookie) and Bukaj (the cashew nut-stuffed Baklava pouch). Over here I saw sweet called zulbia which looked our Indian jalebis which Arva said was influenced by India. Arva later sent a mail detailing out what and where we ate in the walk and gave some useful tips on where to eat during the rest of our trip. Arva recommended eating places for the rest of our trip. The next day my aunt, K and I took the abra (fishing boat) to the spice and gold souks and then headed back to the textile souk in search of Creekside Café which both Arva and Ishita had recommended. This is a café located on the pretty creek and the nice weather meant that we could sit by the creek and have our lunch. The setting was really picturesque. Creekside Café, I am told, is run by two Emirati brothers who are trying to bring in Emirati cooking influences in a modern format. We had an Emirati slow cooked lamb ouzi (traditionally cooked under ground) served as a burrito, scrambled eggs with truffles served as a cylinder in a thin Emirati bread called rgag and a salmon tartare infused with a tangy Arabian curd based labneh dip. All the food served was not only very tasty but looked very pretty too. It was a lot more expensive than the old Dubai eat houses of Ravi and Al Ostadi of course but represented the next stage of evolution of Emirati food. If Al Ostadi is their Bade Miya than Creekside Café is perhaps their equivalent of Indian Accent. Our last dinner in Dubai was with family again at the Lebanese Village Kitchen under the open skies at Bur Dubai where we had a very relaxed meal starting with Lebanese dips of hummus, tabbouleh and baba ganoush. As tutored by Avra and approved of by my uncle, I ordered an arayes. This is Turkish keema (minced meat) stuffed grilled bread similar to the Indian paratha which tasted really amazing. Then there was the kebab khash koush, another Lebanese dish from Avra’s mail to me on what to order and where to eat. This is a lamb mince meat ball dish served in a tomato gravy. The kebabs were a bit dry though or perhaps we were too full by then. One dish that sucked here was the brain dish which lacked spice. I think we Indians do a better job of cooking offal as Anthony Bourdain had once said in the Mumbai based episode of No Reservations. My Pakistani, Emirati, Egyptian, Lebanese, Palestinian and Jordanian meals in Dubai made me realize that Dubai is in a unique place where it can position itself as a destination to enjoy food from all over the Arabic world and West Asia. Of course, as in the metros of India, there is more interest and excitement in opening restaurants that offer Western food in Dubai too than in local food. Ventures like Creekside Café show us that a balance is possible. While I have told you about Dubai’s Arabic culinary story one can’t ignore its immigrants from other countries and how they have come together here to live their lives in harmony. 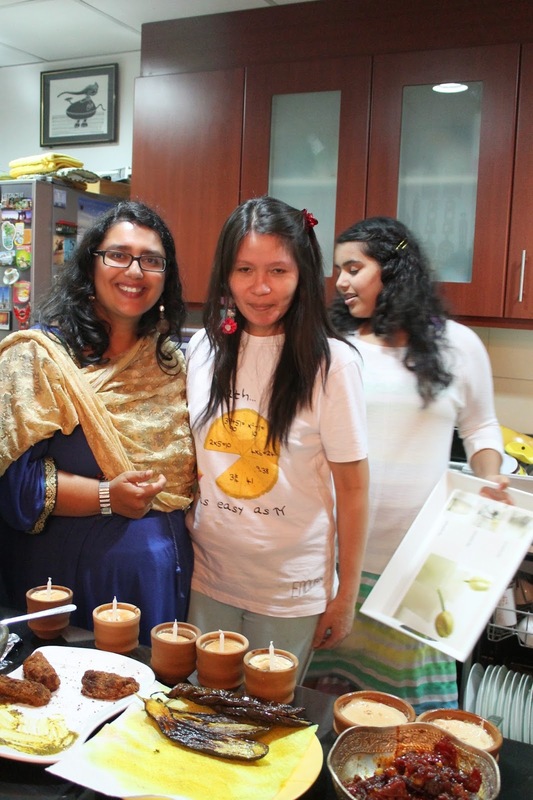 So here is the story of the meal cooked by Ishita, a Bengali, and her Filipino cook, Mela. Ishita very kindly picked K and me up on my birthday and drove us past the very impressive sculpted beaches of the Marina and down the man made palm fronds to her house where we joined her husband Subir and her two daughters for a lovely meal. Ishita’s Filipino cook, whom she calls Lady M, laid out an amazing Bengali spread for our lunch. Ishita had trained M to cook Bengali food. The sight and smells of the prawn topped churmur and air fried vegetable chop starters followed by chholar daal, begun bhaaja, alur dom, mangsher jhol and a dreamy shorshe bhaapa salmon made my feel as if my grandmother had come and cooked a special lunch for me on my birthday. I was touched that Ishita took so much time out from putting the Food e Mag dbx online food magazine that she edits to bed to host us for lunch. 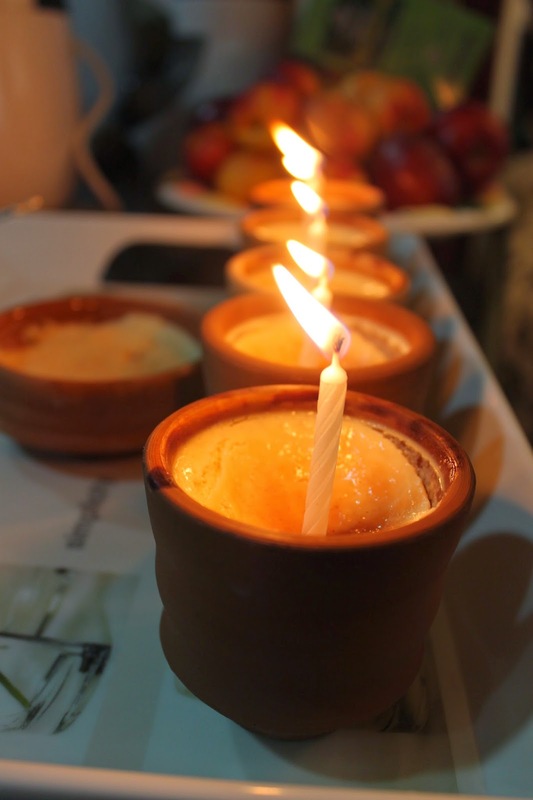 Ishita even made a lovely cheesecake textured mishti doi and put candles in the mishti doi pots for me to blow out to celebrate my birthday and showered me with a bagful of foodie gifts. I have rarely felt as loved as I felt this time in Dubai this time. We did eat in a ‘mall chain’ café twice in the trip. This was at Pauls, the French café, at Burjuman Mall, where the croissants make for a delightful breakfast and the cappuccino is pretty good too. Ohhh! To go to the arabic and turkish and iranian places and eat their food! My friends miss Mumbai so much that I havent yet seen this side of Dubai and I have to before I decide I do not like it! Thanks Kalyan! What an epic post... I am so happy that both of you loved your stay in Dubai this time... so it's the foodie love that makes all the difference, what say? Thank you for spending your birthday with us... and the compliments that you have given is really touching. Mela is too happy... Dubai is such that the Bengali in me has turned Filipina, while she has almost become a Bengali. Can't wait to meet the both of you again - Meena Bazaar or Bohri Mohalla... it's been good meeting you. Not that I ever felt that we hadn't met before! I've always known that Dubai would be a great place to eat in, thanks to my numerous friends there. It's nice to see actual pictures and proof of that fact. The Emirati place that Arva took you too sounds most exciting. It's a place I would like to try out if I ever visit Dubai. This was an excellent read, Kalyan. My Jan trip to the UAE was my first and honestly, I was just looking for much needed time off from work. When I returned, everyone asked me "Did you do the desert safari? "; "Ski Dubai? "; " Ferrari World?" etc... And my reply would be NO. I just wanted to relax. And all I could think of fondly is all the food I tried. From Iranian to Italian to Arabic to Turkish to Lebanese to Japanese and even South Indian... Dubai was perfect. Sadly missed out on Ravi. Next time for sure. PS: I tried the Knafeh at Samadi. Really liked it. beautiful pictures and lovely narration as always ..
loved the dubai scene and local eateries .. we have visited these Mediterranean places in US ..the food is awesome :) flavorful and very tangy...But dubai I guess is the HUB ..
Kalyan, you made discovering the ''other'' side of Dubai a goal, and you've accomplished it and more! I'm so honoured to see Frying Pan make the list, it really was such a delight to serve you. You were open-minded and positive about the experience, something that's often hard to do when you do your own walks back home. But I find that our community of food-walkers is just that - a community - and I'm blessed to have made your acquaintance (all thanks to Ishita!). 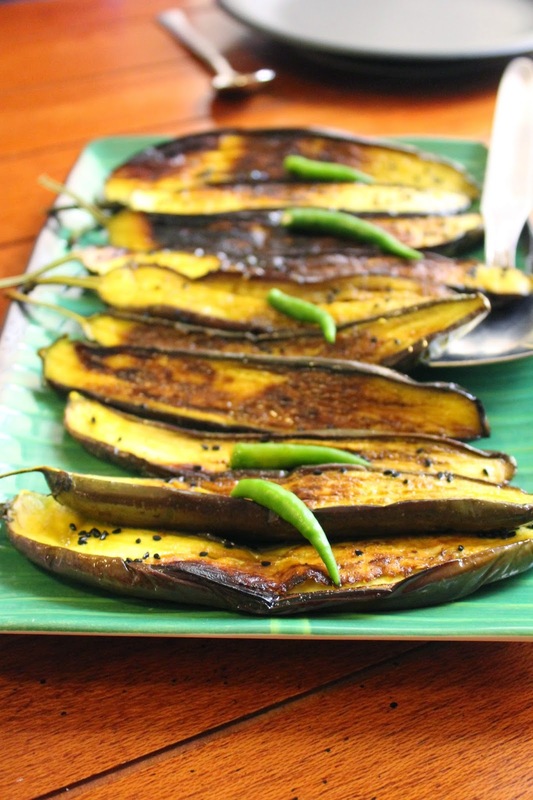 When I'm next in Mumbai, the first thing I'll be doing is signing up for your food walk. I can't wait to learn from you and see the city from your eyes! In Dubai for 3 years now and have only eaten few of these dishes mentioned. The souk in Deira seems to be an undiscovered treasure. I know what I am doing for the next few months now.